Every parent needs a rear-facing seat to keep his little one safe during the ride. There’s no safer option for a child younger than 2 years of age than using a rear-facing option. This protects your child from possible impacts that can occur in case of an accident, and it also provides a comfortable and enjoyable ride. Nowadays, there are numerous options on the market that provide different first-class features, and almost all of them are designed for the maximum level of protection during the ride. They differ in additional features rather than essential things, and you may feel lost among all of their characteristics. How can I determine what is the best choice for me and my child, you may ask? We wanted to answer that question, so we have decided to do thorough research and find the best options one can buy. By following our list and provided in-depth reviews of each of the products, you will be able to choose a perfect one for your child’s needs! Everybody knows about Graco's production of high-quality baby equipment. People love its products for their first-class features that provide a high level of protection, and a comfortable feeling during the ride. One of those great products is also the Graco 4ever. We’re talking about a multifunctional product that works rear-facing car, forward-facing and also as a booster. If you want a durable and safe product that will fulfill all your child’s needs until it stops using a safety seat, Graco is a perfect choice! First thing first – safety! The most important thing about this for you to know is that it provides great safety and Graco really stands out with its high level of protection. This product is crash and side impact tested. Even high temperatures won’t cause any damage that would result in a decrease in the product's protection capacity. 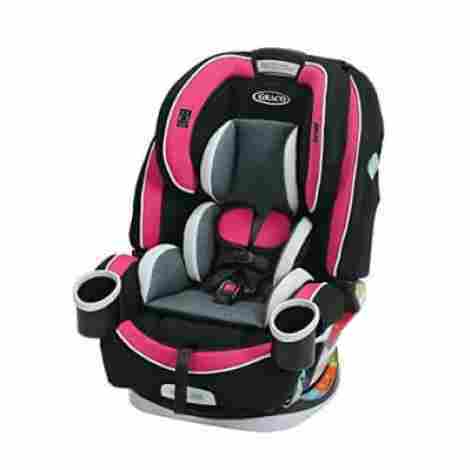 Additionally, Graco has a steel-reinforced frame and energy-absorbing foam that make this durable and safe. Graco has an impressive 40 pounds weight limit that allows extended rear-facing. It’s suitable for children that weight between 4 and 40 pounds. When it comes to the height limit, your child’s head shouldn’t go over one inch below the headrest adjustment button when the headrest is fully extended. When you use it front facing, it’s suitable for children between 22 and 65 pounds, and not shorter than 49 inches. It also works like high-back booster (30-100 pounds) and backless booster (40-120 pounds). Graco is an easy-to-install option, although people often have problems with its bulky design. It is made to fulfill several purposes, but this resulted in making it unsuitable for some types of vehicles. That’s why you should take the measures accurately before you make the purchase. When it comes to installation, there is an indicator that will notify you when it is safely installed. That way, you'll know that everything is in its place. Additionally, Graco features easy-to-use buckles that will keep your child safe. This product is made of machine-washable material that dries fast, so you’ll be able to put it back on in no time. However, the main issue with Graco’s material is that it causes over-sweating! It’s not so noticeable on short rides, but it can be a big issue during longer ones. 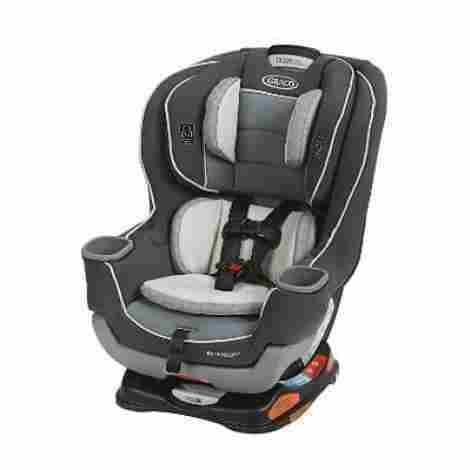 Lastly, Graco’s 4ever is very comfortable and provides additional features, such as cup holders and pockets that add to the overall feeling of coziness. This model has its flaws, sure, but we have to admit that it’s closest to perfect as we can get. Along with high-quality and versatile features comes a reasonable price, especially if we take into account that it’s meant to last. With this product you won’t have to search for all other different styles whenever your child outgrows them – Graco meets all your child's needs. Evenflo Tribute LX is both rear-facing and front-facing option that comes with some seriously good features! 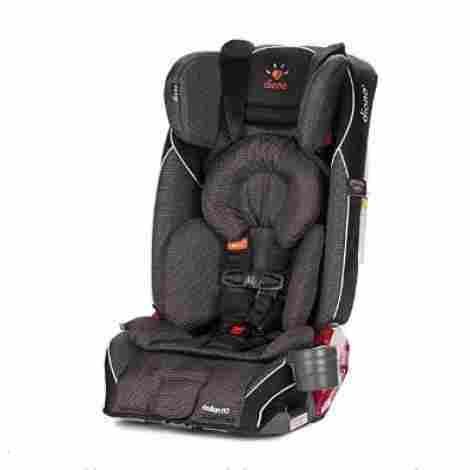 It offers a high level of protection and a comfortable ride experience for your child. If you’re searching for a chair for your child with high portability and easy installation settings along with compact design so you can use it in your car or on the plane, Evenflo Tribute LX is an excellent choice! This option can hold a rear-facing infant from 5 to 30 lbs (height: 19 to 37 inches) and a front-facing toddler from 22 to 40 lbs (height: 28-40 inches). It also features several shoulder strap and crotch buckle positions as well as 5 point harness, which makes it suitable for almost every child and provides an easy and secure installation. It is crash tested so you’ll have a peace of mind knowing that it’s perfectly safe during the ride. However, the main issue with this is the fact that it’s difficult to recline it. You’ll have to use a towel or some other material underneath for a better position. Evenflo Tribute LX is a compactly designed option that can fit almost any type of vehicle. It provides a lot of free space in the back of your car, unlike bulky styles that take up all the free space. It is also lightweight (12 pounds) so it can be transported easily. When it comes to material and additional features, this product has machine-washable pads that you can clean fast and easy. Only parents know how useful is to have a removable material so that you can simply put into the washing machine. It also features a removable cup holder that comes very useful when your kid is a bit older. The lack of cloth guards on the straps may cause concern for you though. Without them, the straps can cause irritation on your child’s skin. You can buy the guards separately of course, but the lack of this kind of protection is really an issue that we hope the manufacturer will resolve in the future. Evenflo Tribute LX is a high-quality and versatile style that’s surprisingly inexpensive! Its attractive price allows you to use it just rear-facing, and then you can purchase a new front-facing option if you need something bigger when your child outgrows it. However, considering the great features of this product, it seems that you won’t need another product for a long time! If you want a rear-facing option that can extend for more free space and comfort, then Graco Extend2Fit might be the perfect choice for you! This product provides many first-class features as well as additional ones that prove to be very useful for longer rear-facing. Graco Extend2Fit has a 50 pounds weight limit which makes it suitable for children of different age. It’s one of the safest and most durable rear-facing styles that one can get. Graco has been thoroughly tested in real-life crash scenarios. It has consistently shown excellent performance both in crash and side-impact tests. Also, it is extra padded for more protection and a more comfortable feeling. The installation is easy as it can be – you just need to snap the straps onto the vehicle’s anchors and release it with a simple push of a button. 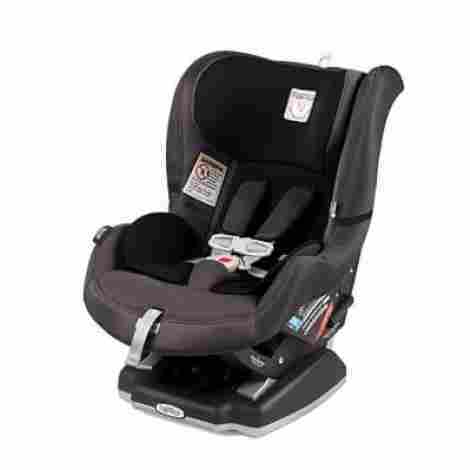 Graco Extend2Fit is specially designed to provide a more comfortable experience for your child. It features an adjustable leg extension (5 inches) that provides more legroom. When it comes to reclining positions, Graco offers 6 positions and 4 of them can be used in rear-facing. Lastly, it is not too bulky and also very light, so you can transport it with ease. It’ll fit almost any type of vehicle. Many parents complained about the cover and that is hard to wash. It seems that the cover has many small loops and hooks that keep it in its place, and they make a real hassle out of the washing process. We know how children can be messy, and the cover that is easy to clean saves you a lot of time! Therefore, we find that this is a big drawback with this Graco option. However, there are some variations in the design of this model, and it seems that there are more expensive styles with the same features that actually have an easy-to-remove cover. 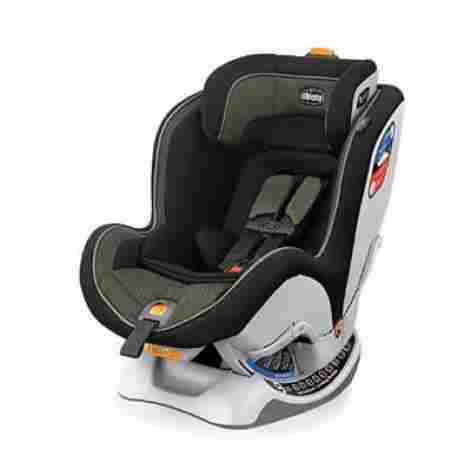 This model of this product from Graco provides excellent value for the money. It’s a perfect choice for those who are on a budget but want to get a quality chair for their child! Safety 1st is a well-known manufacturer dedicated to providing the maximum level of protection during car rides, offering many different kinds and styles and other children products. The Go 3-in-1 is possibly the most comfortable options we have encountered. It’s also user-friendly and easy to maintain, so both parents and children will be fully satisfied with it! Grow and Go is designed to provide a safe ride and to extend the use of the rear-facing chair– it can hold up to 40 pounds in a rear-facing position which means that your child can ride in this position even after 2 years of age. Actually, most experts advise that you keep your child rear-facing a bit longer than prescribed because it’s the safest position for a young child. Grow and Go is crash tested, fulfilling federal safety standards. It can be used as rear-facing, forward facing and as a booster. 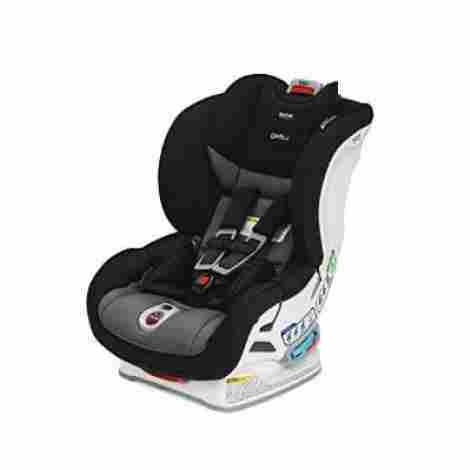 When used rear-facing it supports infants from 5 to 40 pounds, and for the other two options, it respectively goes up from 22 to 65 pounds and from 40 to 100 pounds. Therefore, Grow and Go fits every stage of your child’s development. Grow and Go is quite easy to install. It features 3 recline positions – one for infants and two for older babies and toddlers. It also features a quick fit 5-position harness that allows you to easily secure your baby, and it has holders that keep the harness in an open position. This will allow you to put your child in and get it out without being tangled in the straps every time. When it comes to straps, although they are padded to provide additional comfort, some parents complained about a wide chest clip being uncomfortable. Others complained about not being able to tighten the straps enough in the infant position. This is designed to provide a few extra inches of legroom for you when your child is in a rear-facing position. However, that’s not the thing that every parent praises about this product. What they find a number one additional feature is the machine-washable cover. You can easily take it off, wash it in the machine and put it back in no time. Grow and Go is a high-quality option that’s reasonably priced. You’ll get a versatile style that will follow your child’s growth, providing all necessary features. However, let’s not forget that you’ll save some time with easy-to-use and useful features. Grow and Go is simply designed to suit both children and parents’ needs. Britax Marathon is one of the safest and most versatile styles on the market. It has a ClickTight system that makes the installation incredibly easy and many additional features that provide comfort and maximum level of protection during the ride. You just can’t go wrong with Britax Marathon! Britax is made to provide a maximum level of protection to your child even in the most dangerous situations. It’s one of the safest options on the market. It features durable V-shaped straps that provide good protection and comfort. There are 14 harness positions and 2 buckle positions that you can adjust to your child’s needs. What’s even more important, Britax offers 7 recline positions to ensure a feeling of full comfort, and with an easy installation angle. Last but not least, it is suitable for rear-facing, supporting weight from 5 to 40 pounds, and forward-facing from 20 to 65 pounds. That way, Britax made sure that this product adapts to different stages of your child’s development. Britax features a ClickTight system, making it easy to install and transport. You’ll be set to go within a few moments. It provides a tight fit – you can easily adjust harness straps and secure your baby. When it comes to quality and durability of the materials, the Britax offers a layer of side impact protection, a steel frame and impact absorbing base. However, keep in mind that this is quite large, so it may not fit in every type of vehicle. You should take the measures accurately and compare it to the available space in your car. Britax is on the pricey side, but many parents think that it’s worth every penny. However, because it’s a bulky style that may not fit your car, take the measures accurately – you don’t want to make such a big investment if you’re not sure that it will even fit your vehicle. Evenflo Symphony Elite is an all-in-one option that offers many good-quality features and a user-friendly design. If you’re searching for an easy-to-install and also a highly comfortable chair that you can use not only for rear-facing but also for front-facing and as a booster, you have found a perfect product for your child’s needs! Evenflo Symphony Elite can be used as a rear-facing (5-40 pounds) and forward-facing (22-40 pounds) option as well as a booster (40-110 pounds). It offers 3 recline positions, 1 for every type of usage. We have to say that this is not very impressive, especially compared to the earlier reviewed options that have 5 or more recline positions. The manual instruction suggests using a towel underneath for better reclining, but we’re not satisfied with this even if it actually works pretty well. Evenflo’s various features are meant to provide a safe ride for your child. For example, the E3 side impact protection reduces side impact crash forces up to 50%. This is possible due to the larger head and torso protection panels. There’s also a removable pad (an infant insert) that ensures more protection during rear-facing. Evenflo features an auto-retracting Sure LATCH system that makes the installation incredibly easy. There’s also a 5-point Infinite Slide Harness that allows for a completely accurate fit every time your child is in the car. Another adjustable feature is the headrest that you can adjust according to your child's growth and needs. When it comes to the overall design of the Evenflo Symphony, we can say that the manufacturer made an effort to design a chair with a goal of making the ride comfortable and the product easy to use. Firstly, it has an energy-absorbing foam liner that makes it very safe and comfortable. Secondly, the cover is removable and machine-washable. Additionally, there are 2 cup holders that can be used as bottle or toy storage. That being said, we have to notice that some compromise with weight had to be made. Evenflo Symphony is rather wide and will probably take up quite a lot of free space in the back of your vehicle. Therefore, you should consider whether it can fit your car before you make the purchase. Evenflo Symphony Elite is one of the highest-quality and most versatile styles in the market that offers great value for money. Sure, there are a few small flaws that you should keep in mind, but overall we’re talking about a great product that will last for a long time! Chicco NextFit is a comfortable rear-facing option that’s one of the best options for extended rides and car trips. It features several features that add to the overall feeling of comfort and safety during the ride. If you’re searching for a reliable and durable chair for your child, Chicco is an excellent choice! NextFit meets all federal crash safety requirements, having many safety features such as energy-absorbing foam, side-impact protection, and steel frame. It can handle 40 pounds in the rear-facing position and then you can continue to use it as a front-facing style(up to 65 pounds). It has multiple features that provide a tight fit and all of them are adjustable, and therefore suitable for many stages of your child’s development. While the steel frame provides maximum protection for your child in case of an accident, it makes the seat very heavy. You should carefully take the measures and check if your car has enough free space for this bulky rear-facing seat. In most cases, this can’t fit in small vehicles, but it’s worth to give it a try. Some parents also had problems with adjusting the harness in the rear-facing position. Chicco used quality materials that will provide a comfortable ride for your child. Actually, this is one of the most comfortable options available on the market. It has 9 reclining positions that allow for easy installation and gives your child a comfortable feeling. If you have a big vehicle, sleeping is guaranteed with 9 reclining angles! Additionally, you can easily install this because of SuperCinch strap design – you can tighten them with a simple pull on both sides. You also don’t have to worry about your child making a mess because the cover is machine-washable and easy to take off. A peaceful ride is guaranteed with Chicco NextFit! Chicco NextFit offers some first-class features but it feels a bit overpriced. If you have a few extra bucks, you shouldn’t hesitate to spend them on this excellent product. However, you should take our advice seriously and check the measures before the purchase. 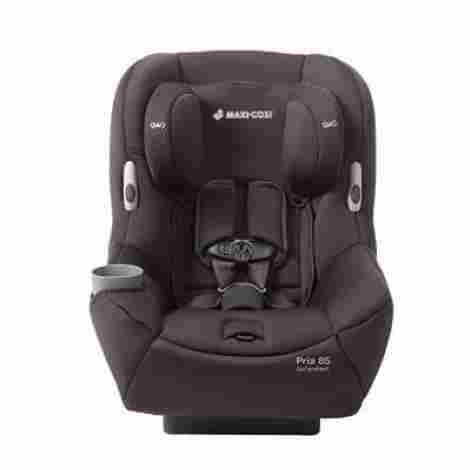 Maxi-Cosi Pria 85 is an excellent 2-in-1 option (rear and front-facing) that offers high-quality features and a high level of protection. If you’re interested in the product that provides many safety features along with user-friendly design keep reading our detailed review! Maxi-Cosi Pria is a safe and versatile style that features side impact protection and a FlexTech shock absorption system. This way, the seat absorbs the impact instead of transferring it. It meets all required safety standards, so you can use it without worries. Maxi-Cosi can be used rear-facing from 14 to 40 pounds as well as front-facing from 22 to 85 pounds. It has 5 points adjustable harness as well as holders that will keep the straps out of the way. This way you won’t get tangled in the straps every time you try to put your child in and get it out of it. You can also adjust the headrest for a proper fit. Maxi-Cosi knows every parent’s needs and that’s why it made this product out of machine-washable material that can be dried in the dryer! Yes, you read it well, Maxi-Cosi features a cover that is easy to maintain – there won’t be any more headaches because of messy seats that have to be spot-cleaned. This product features deep recline for a rear-facing position which provides a comfortable experience for your child, and it also allows you to install it in just a few moments. It has a one-click LATCH installation system, but this doesn’t work for vehicles that don’t have LATCH. This is a big flaw so keep in mind that you’ll have to think about other installation options and maybe consult an expert in this matter. We find that Maxi-Cosi Pria 85 is a bit pricey product. It provides excellent value undoubtedly, and those who have some extra money to spend won’t be disappointed. However, don’t forget that the lack of LATCH could be a problem! Diono Radian RTX is a 3-in-1 option that offers comfort, safety, and easy installation. 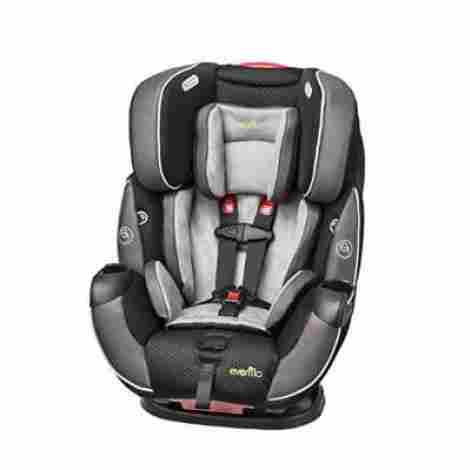 If you’re searching for an option that will allow you to keep your child longer in a rear-facing position, Diono Radian RTX is a perfect pick! It offers more space for your child and it can hold more weight than regular rear-facing options, providing a cozy and safe ride! This product is designed to provide more room in the rear-facing position, giving your child a comfortable feeling and keeping it safe. It can hold weight over 45 lbs in a rear-facing position, and it can accommodate child’s weight from 20 to 65 pounds in a forward-facing position, and from 50 to 120 pounds when it’s used as a booster. Diono is made from sturdy materials and it features a steel frame that contributes to the entire high-level protection concept that this manufacturer follows. It also has aluminum reinforced sidewalls and an extra layer of side impact protection on the headrest, along with energy-absorbing foam that surrounds your child. Lastly, you can easily install Diono, especially because it has an audible click that informs you that everything is in its place! There are also 5 shoulder and 3 buckle positions that enable a perfect fit. Although Diono has many different features for extra sturdiness and protection during the ride, this wasn’t done on the expense of compact design. The seat doesn’t take up all the free space in the back of the car like some of the other extra-reinforced seats. On the other hand, the downside can be the seat’s weight - Diono is one of the heaviest options out there! Overall Diono Radian RXT is very comfortable. It features a 12-position adjustable headrest, infant body support cushions, and memory foam. 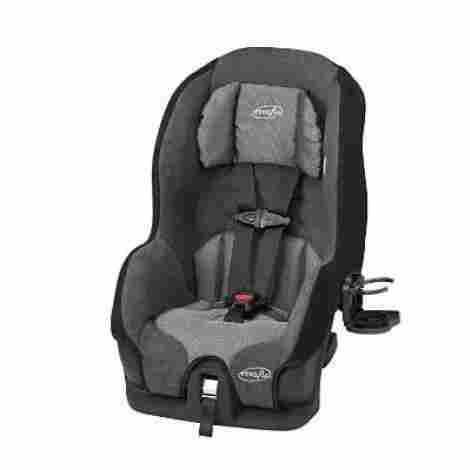 Your child will be snug in their chair even at long distance car trips! Diono Radian RXT provides great value but we have to warn you that it’s quite an investment! Those who want this great 3-in-1 will have to spend more than just a few bucks to get it. Peg Perego Primo Viaggio is a versatile style that will suit your child’s needs from infancy through the toddler years. It’s an excellent choice as rear-facing and front-facing, providing high-quality features and maximum safety during the ride. If you want to know more about this great product, keep reading our in-depth review of Primo Viaggio! Primo Viaggio offers many safety features such as side impact protection, shock absorbing foam, and energy-absorbing foam. This way, your child is completely protected in case of an accident. The seat can hold up to 45 pounds and provides some extra room for growing children, so you can use it rear-facing even when your child is older than 2 years of age. Then you can turn it around to be front-facing that can hold up to 65 pounds. We shouldn’t forget to mention that Primo Viaggio is also suitable for babies that weight 5 or more pounds because it includes infant inserts that provide extra safety for little ones during the ride. Primo Viaggio is incredibly easy to install using LATCH or the vehicle belt. There is a very useful harness holding system that gets the harness out of the way when you put your child in or pull it out of the seat. The harness has 10 height adjustment options and the crotch strap features one position. The entire chair is padded and cushioned for a comfortable ride, and it features machine-washable material. It’s not lightweight, but it’s neither too bulky (21 pounds). You may have some problems with transportation, but most people don’t move all-in-one seats from car to car. However, if you personally prefer a seat that you can move around easily, this one is not a good choice for you. Peg Perego made this great product, but we have to warn you that it will cost you an arm and a leg! We definitely recommend this safe and user-friendly option if you have that extra money. It will last for a long time and it will provide a super safe and cozy ride for your child. Safety was the first and most important thing that we took into account when we made a list of 10 best. Truth to be told, we picked the safest products that could be found on the market, so there are no differences between the products on our list in that matter. 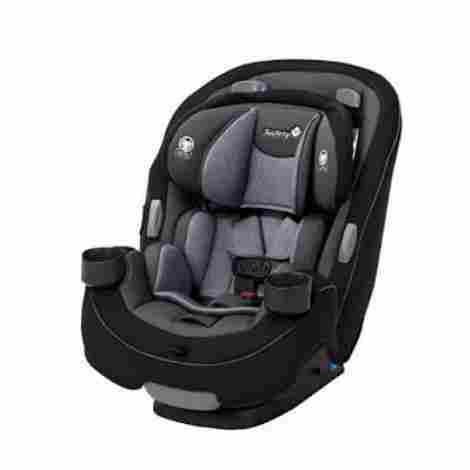 However, there are some differences in the additional features that provide a comfortable ride and tight fit such as padded straps, recline and harness adjustable positions, infant pads and other. The overall design of every option on our list was very important. Not only that great design adds to the safety and comfortable feeling when using the product, but it also helps parents. Along with quality materials, parents want to have machine-washable materials and easy-to-use straps. Easy installation and compact design were also important things that we took into account while evaluating the best options. Last but not least, we compared the overall value that parents will get for the money. Along with quality features, we ranked the products on our list according to their durability and lifespan, so parents can be calm knowing that they’re getting a long-lasting product. There are many high-quality products that offer numerous features at the expense of compact design. This is not an issue for parents that drive SUV’s or other types of large vehicles with a lot of free space in the back, but the ones that have a small car could have big problems fitting a bulky style into their car. Take the measures carefully and examine the free space you have in your car before you make the final decision. A bulky option isn’t only a problem for people with small cars, but also for parents who want to frequently move it from car to car, or use it on airplanes. If you’re one of them, you should aim for a lightweight and compactly designed option. Rear-facing chairs can be really expensive. The price doesn’t always determine the quality – there are many well-priced options that feature a maximum level of protection during the ride, as well as some first-class products that fail in providing essential things. Versatile styles are a great option because they offer multiple positions that can follow the stages of your child’s development and last for a long time. Q: Until what age should we use the rear-facing position? A: National Highway Safety Administration and the American Academy of Pediatricians recommend that children ride rear-facing until they’re 2 years old. While from 2 years onward it’s safe to use a front-facing position, most styles that convert allow the weight up to 40 lbs. Therefore, you can extend the use of rear-facing style to be completely sure that your child is safe during the ride. Q: Why is rear-facing safer than forward-facing? A: Rear-facing support your child’s head, neck, and spine during the accidents. They absorb the forces of the crash rather than transfer it to the child’s body. Children in rear-facing position fall back right into the chair, which is the safest option during the crash. All this is important because children under 2 years of age are not strong enough to endure the strong forces of the crash. Q: What is a LATCH system? A: LATCH is a system that makes installation effortless and safe as it can be. It allows you to install the chair in any position in the car. You can use a built-in top tether or a top strap and the lower anchors to secure the seat properly.